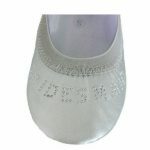 Bring your inner Cinderella to life with our gorgeous fold-up white Bridal ballet flats! Our special limited edition flats are the perfect ballet shoe for dancing the night away! You will never have to flee the ball like Cinderella with our Bridal fold-up flats, the gorgeously flirty, super comfy, fold-up ballet shoe that fits snugly into their own little purse pack! The perfect companion for photo shoots in the garden or a long night on the dance floor, simply pop your bridal heels in the handy white tote bag provided, and dance the night away in ballet shoe comfort!